ABC journalist and bete noire of chavismo for all of the insider leaks he has been reporting, Emili Blasco, writes a piece in ABC about how the FARC is preparing its retreat to Venezuela once (before?) any peace treaty is signed with the Santos administration. The argument of Blasco is that the closing of the Colombian Venezuelan border since last year was in fact an excuse to justify removing some of the military contingent there and allow thus for less surveillance. The objective would have been to ease the transfer from Colombia to Venezuela of some of the FARC weaponry, drug manufacturing and guerilla personnel that cannot remain safely inside Colombia once a peace treaty is signed (forget about a referendum on it and an eventual enforcing, these are another matter). In 2012 I did draw this map below where that whole chavo-narko-FARC strategy was put together (retaken in 2013). The saddest part of it all is that the FARC as well as the regime are absolutely oblivious of the consequences for the population' suffering that such a resettlement would entail. There goes to tell you how soulless a narko system becomes. Let's not forget that Castro has always sponsored drug trafficking to democracies as a way to weaken them. In Venezuela he seems that he has succeeded and in Colombia he is getting a new start courtesy of Santos (who in addition of his weaknesses will likely face soon million of hunger refugees from Venezuela). As far as chavismo, Castro and the FARC are concerned, poverty and violence are a good tool to control the populace. Hat tip for the Blasco article to my friend Fausta, always on top of such stuff. Daniel, in this "tip" theory whatever it is, why would closing the border help move the Farc through? Tge regime could easily have reduced military presence with it open could they not? Or did it somehow reduce the Colombian military presence by closing the border? When you close a border you can control better who goes through: there are less of them. You can then do different things. For example fortify a particular sector where you being security from elsewhere. So you can bring through what you want. Inversely once passage has ceased you empty a section of the border so you do not have to see what you want to pretend you do not see. Whatever you decide to do you always have the advantage of less passerby glancing at stuff that they should not be looking at. FARC has had camps due SW of Machiques for many years. Quite a few years ago I entered that area after I accepted a ride on a pickup by a guy who didn't understand the local roads very well. As we moved away from Machiques Colon road we started seeing less and less people. The last guy I saw was a man riding a bicycle coming the opposite direction, he appeared to be very surprised to see us. Anyway, we eventually turned around and when I got to town and mentioned what I did to my security detail they almost fainted. They said that area was off limits, even for the national guard. The deal GNB had with the FARC was to let them know 72 hours ahead of time about their need to enter. The FARC would move out of the way, the GNB entered in a convoy with at least 24 soldiers, do whatever and then pull out. That area had been inhabited by Indians, many of them had moved out and lived in really awful invasions just outside Machiques, San Jose, and other towns in the area. Fernando you always have an inside view of whats going on, appreciated that you share it. You likely have already explained or may not want to, but what is it you do? he is a Lego pro! "La confirmación de laboratorios de cocaína de lado venezolano muestra que la guerrilla quiere poner a salvo su negocio". As usual, the reason behind all this is $$$$$. The Farc were given Carte Blanche in Colombia not "to avoid violence", but because many people were bribed with drug money. Now they will expand in Venezuela, because there's a good market there to sell their drugs. And because they 'officials' are also bribed to let them in. You see, it's not very complicated. In Venezuela it's always about "cuanto hay pa'eso"? Not that there aren't lots of drugs in Vzla already. Most of the crimes and murders in the barrios are related to drugs. It's big business, and opposing gangs murder each other. It's probably the main reason murder rates in Vzla are breaking world records. That, and theft of course. 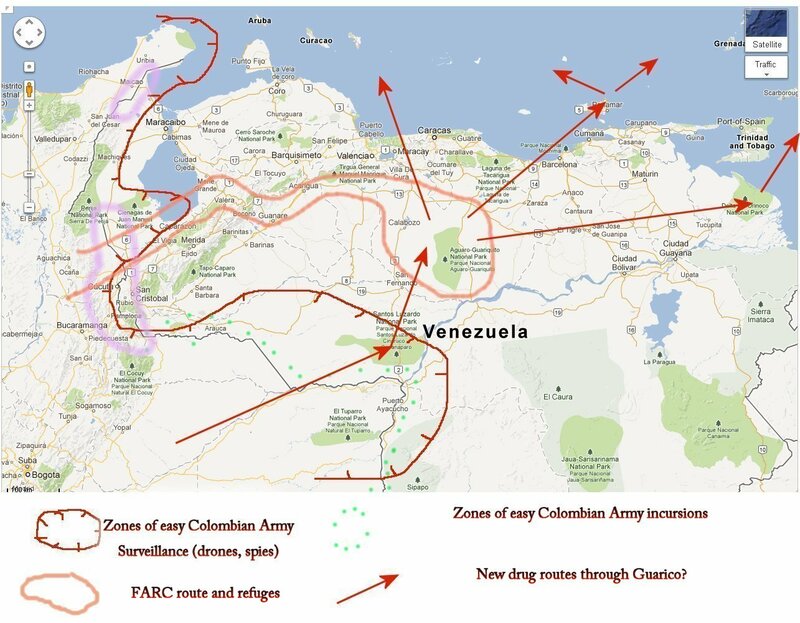 So when the FARC makes Vzla its new home, there will be even more drugs, and even more murders and violence. There's no real police, the corrupt military won't do any but get bribed, so the drug dealers will be free to expand and kill with their vendettas, since there's total impunity for crimes there. Good luck.. Anyone know what happened to The Devil's Excrement? CARACAS – The speaker of Venezuela’s National Assembly, opposition leader Henry Ramos Allup, denounced on Tuesday before the Attorney General’s Office the Aug. 20 ruling of the Supreme Court of Justice (TSJ) invalidating the work done in seven sessions of the legislative body. “We address the Attorney General’s Office here today in order to present a document with several annexes in which we denounce... new attempts by the Constitutional Chamber of the TSJ to initiate procedures that violate and misinterpret the Constitution as well as the functions of the National Assembly,” Ramos Allup told reporters at the AG’s office. The opposition leader described the ruling handed down by the TSJ as “meaningless” and repeated that the legislature with its opposition majority will not accept any order of the Supreme Court of Justice because, in his opinion, it is not correctly constituted. According to Ramos Allup, “six of the seven judges do not comply with the professional requirements for sitting on the bench,” adding that the Assembly is investigating one of them because he has apparently never even been an attorney. Therefore, he said, the Assembly will continue legislating despite any sentence the TSJ might hand down.